The Tupolev Tu-154 (Russian: Tyполев Ту-154; NATO reporting name: "Careless") is a three-engine medium-range narrow-body airliner designed in the mid-1960s and manufactured by Tupolev. A workhorse of Soviet and (subsequently) Russian airlines for several decades, it carried half of all passengers flown by Aeroflot and its subsidiaries (137.5 million/year or 243.8 billion passenger km in 1990), remaining the standard domestic-route airliner of Russia and former Soviet states until the mid-2000s. It was exported to 17 non-Russian airlines and used as a head-of-state transport by the air forces of several countries. With a cruising speed of 850 kilometres per hour (530 mph) the Tu-154 is one of the fastest civilian aircraft in use and has a range of 5,280 kilometres (3,280 mi). Capable of operating from unpaved and gravel airfields with only basic facilities, it was widely used in the extreme Arctic conditions of Russia's northern/eastern regions where other airliners were unable to operate. Originally designed for a 45,000 hour service life (18,000 cycles) but capable of 80,000 hours with upgrades, it was expected to continue in service until 2016, although noise regulations have restricted flights to western Europe and other regions. In January 2010 Russian flag carrier Aeroflot announced the retirement of its Tu-154 fleet after 40 years, with the last scheduled flight being Aeroflot Flight 736 from Ekaterinburg to Moscow on 31 December 2009. 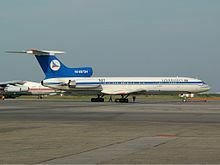 Since 1968 there have been 39 fatal incidents involving the Tu-154, most of which were caused either by factors unrelated to the aircraft, incorrect maintenance, or by its extensive use in demanding conditions. Also, few of the Tu-154 accidents appear to have involved technical failure. The Tu-154 was developed to meet Aeroflot's requirement to replace the jet-powered Tu-104 and the Antonov An-10 and Ilyushin Il-18 turboprops. The requirements called for either a payload capacity of 16–18 tonnes (35,000–40,000 lb) with a range of 2,850–4,000 kilometres (1,770–2,490 mi) while cruising at 900 km/h (560 mph), or a payload of 5.8 tonnes (13,000 lb) with a range of 5,800–7,000 kilometres (3,600–4,300 mi) while cruising at 850 km/h (530 mph). A takeoff distance of 2,600 metres (8,500 ft) at maximum takeoff weight was also stipulated as a requirement. Conceptually similar to the British Hawker Siddeley Trident, which first flew in 1962, and the American Boeing 727, which first flew in 1963, the medium-range Tu-154 was marketed by Tupolev at the same time as Ilyushin was marketing the long-range Ilyushin Il-62. The Soviet Ministry of Aircraft Industry chose the Tu-154 as it incorporated the latest in Soviet aircraft design and best met Aeroflot's anticipated requirements for the 1970s and 1980s. The first project chief was Sergey Yeger; in 1964, Dmitryi S. Markov assumed that position. In 1975, the project lead role was turned over to Aleksandr S. Shengardt. The Tu-154 first flew on 4 October 1968. The first deliveries to Aeroflot were in 1970 with freight (mail) services beginning in May 1971 and passenger services in February 1972. There was still limited production of the 154M model as of January 2009 despite previous announcements of the end of production in 2006. 1025 Tu-154s have been built, 214 of which were still in service as of 14 December 2009. The last serial Tu-154 was delivered to the Russian Defense Ministry on 19 February 2013 from the Aviakor factory, equipped with upgraded avionics, a VIP interior and a communications suite. The factory has four unfinished hulls in its inventory which can be completed if new orders are received. The Tu-154 is powered by three rear-mounted low-bypass turbofan engines arranged similarly to those of the Boeing 727, but it is slightly larger than its American counterpart. Both the 727 and the Tu-154 use an S-duct for the middle (Number 2) engine. The original model was equipped with Kuznetsov NK-8-2 engines, which were replaced with Soloviev D-30KU-154 in the Tu-154M. All Tu-154 aircraft models have a relatively high thrust-to-weight-ratio which give excellent performance, at the expense of lower fuel efficiency. This became an important factor in later decades as fuel costs grew. The flight deck is fitted with conventional dual yoke control columns. Flight control surfaces are hydraulically operated. The cabin of the Tu-154, although of the same six-abreast seating layout, gives the impression of an oval interior, with a lower ceiling than is common on Boeing and Airbus airliners. The passenger cabin accommodates 128 passengers in a two-class layout and 164 passengers in single-class layout, and up to 180 passengers in high-density layout. The layout can be modified to what is called a winter version where some seats are taken out and a wardrobe is installed for passenger coats. The passenger doors are smaller than on its Boeing and Airbus counterparts. Luggage space in the overhead compartments is very limited. Like the Tupolev Tu-134, the Tu-154 has a wing swept back at 35° at the quarter-chord line. The British Hawker Siddeley Trident has the same sweepback angle, while the Boeing 727 has a slightly smaller sweepback angle of 32°. The wing also has anhedral (downward sweep) which is a distinguishing feature of Russian low-wing airliners designed during this era. Most Western low-wing airliners such as the contemporary Boeing 727 have dihedral (upward sweep). The anhedral means that Russian airliners have poor lateral stability compared to their Western counterparts, but also have weaker Dutch roll tendencies. Considerably heavier than its predecessor Soviet-built airliner the Ilyushin Il-18, the Tu-154 was equipped with an oversized landing gear to reduce ground load, enabling it to operate from the same runways. The aircraft has two six-wheel main bogies fitted with large low-pressure tires that retract into pods extending from the trailing edges of the wings (a common Tupolev feature), plus a two-wheel nosegear unit. Soft oleo struts (shock absorbers) provide a much smoother ride on bumpy airfields than most airliners, which very rarely operate on such poor surfaces. The original requirement was to have a three-person flight crew – captain, first officer and flight engineer – as opposed to a four- or five-person crew, as on other Soviet airliners. It became evident that a fourth crew member, a navigator, was still needed, and a seat was added on production aircraft, although their workstation was compromised due to the limitations of the original design. Navigators are no longer trained and this profession is becoming obsolete with the retirement of the oldest Soviet-era planes. The latest variant (Tu-154M-100, introduced 1998) includes an NVU-B3 Doppler navigation system, a triple autopilot, which provides an automatic ILS approach according to ICAO category II weather minima, an autothrottle, a Doppler drift and speed measure system (DISS), and a "Kurs-MP" radio navigation suite. A stability and control augmentation system improves handling characteristics during manual flight. Modern upgrades normally include modernised TCAS, GPS, and other systems (mostly American-made or EU-made). 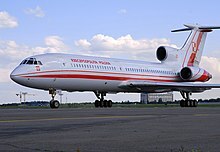 Early versions of the Tu-154 cannot be modified to meet the current Stage III noise regulations and are no longer allowed to fly into airspace where such regulations are enforced, such as the European Union. However, the Tu-154M's D-30 engines can be fitted with hush kits, allowing them to meet noise regulations. Many variants of this airliner have been built. Like its western counterpart, the 727, many of the Tu-154s in service have been hush-kitted, and some converted to freighters. Tu-154 production started in 1970, and the first passenger flight was performed on 9 February 1972. Powered by Kuznetsov NK-8-2 turbofans, it carried 164 passengers. About 42 were built. As the original Tu-154 and Tu-154A suffered wing cracks after a few years in service, a version with a new, stronger wing, designated Tu-154B, went into production in 1975. It also had an additional fuselage fuel tank, additional emergency exits in the tail. Also, the maximum takeoff weight increased to 98,000 kg (216,053 lb). Important to Aeroflot was the increased passenger capacity, hence lower operating costs. With the NK-8-2U engines the only way to improve the economics of the airplane was to spread costs across more seats. The autopilot was certified for ICAO Category II automatic approaches. Most previously built Tu-154 and Tu-154A were also modified into this variant, with the replacement of the wing. Maximum takeoff weight increased to 96,000 kg (211,644 lb). 111 were built. Aeroflot wanted this version for increased revenue on domestic routes. It carried 160 passengers. This version also had some minor modifications to the fuel system, avionics, air conditioning, and landing gear. 64 were built from 1977 to 1978. A minor modernization of Tu-154B-1. The airplane was designed to be converted from the 160 passenger version to a 180 passenger version by removing the galley. The procedure took about 2 1/2 hours. Some of the earlier Tu-154Bs were modified to that standard. Maximum takeoff weight increased to 98,000 kg (216,053 lb), later to 100,000 kg (220,462 lb). Some 311 aircraft were built, including VIP versions. A few remain in service. 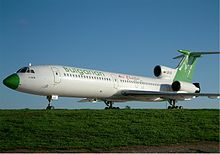 A Tu-154 converted into a testbed for alternative fuels. It first flew in 1988 and was used until the fall of the Soviet Union, when it was placed in storage. Initial designation of the Tu-154M. Proposed stretched version of Tu-154. Proposed shortened version of Tu-154. In February 2011, all remaining Iranian Tu-154s were grounded after two incidents. On 27 December 2016, the Russian Ministry of Defence announced that it had grounded all of its Tu-154s until the end of the investigation into the December 2016 crash of a 1983 Tupolev Tu-154. This was followed by the grounding of all Tu-154s in Russia. The Tu-154 had crashed into the Black Sea just after takeoff from Sochi, Russia, on 25 December 2016 killing all 92 people on board, including 64 members of the Alexandrov Ensemble, an official army choir of the Russian Armed Forces. The Red Army Choir singers and dancers were en route to Syria to entertain Russian troops in the run-up to the New Year. Polish Air Force – 1 Tu-154M was retired in 2011, 1 Tu-154M crashed in 2010. Between 1970 and December 2016 there have been 110 serious incidents involving the Tu-154, and 69 hull losses, 30 of which did not involve fatalities. Of the fatal incidents, five resulted from terrorist or military terrorist action (two other wartime losses were non fatal), several from poor runway conditions in winter (including one in which the airplane struck snow plows on the runway), cargo overloading in the lapse of post-Soviet federal safety standards, and mid-air collisions due to faulty air traffic control. Other incidents resulted from mechanical problems (two cases prior to 2001), running out of fuel on unscheduled routes, pilot errors (including inadequate flight training for new crews), and cargo fires; several accidents remain unexplained. 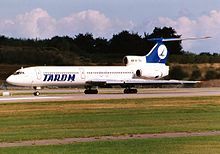 The Tu-154 is described as having an average (or better than expected) safety record considering its length of service and heavy use in demanding conditions where other airliners are unable to operate. On January 2, 2011, Russia's Federal Transport Oversight Agency advised airlines to stop using remaining examples of the Tu-154 (B variant) until the fatal fire incident in Surgut had been investigated. Its operation in Iran ceased in February 2011 due to a number of crashes and incidents involving the type (almost 9% of all Tu-154 losses have occurred in Iran). This grounding compounded the effects of US embargo on civil aircraft parts, substantially decreasing the number of airworthy aircraft in the Iranian civil fleet. In 2010 there were two fatal losses of the Tu-154 due to pilot error and/or weather conditions (a Polish presidential jet attempting a rural airfield landing in heavy fog, the 2010 Polish Air Force Tu-154 crash, and a Russian-registered plane that suffered engine stall after a crew member accidentally de-activated a fuel transfer pump). Following these accidents, in March 2011 the Russian Federal Bureau of Aviation recommended a withdrawal of remaining Tu-154Ms from service. In December 2010, Uzbekistan Airways also declared that it will cease to operate Tu-154s from 2011. On 27 December 2016, the Russian Defence Ministry grounded all Tu-154s in Russia pending investigation into the 25 December 2016 Tupolev Tu-154 crash which killed 64 members of the Alexandrov Ensemble, an official Red Army Choir of the Russian Armed Forces. CCCP-85020 a Tu-154 at the Ukraine State Aviation Museum. EW-85581 a Tu-154B-2 in the grounds of Minsk National Airport in Belarus. HA-LCR is at Thessaloniki International Airport, after being written off following a landing with landing-gear retracted. It is used for fire-training. HA-LCG a Tu-154B-2 at the Aeropark museum in Budapest. Tu-154 is the most popular airliner appearing in many Soviet and Russian films. Air Crew is the 1979 action film revolving around the exploits of a Soviet Tu-154 crew on an international flight, the first Soviet film in the disaster genre. ^ Rabinowitz, Jason (February 26, 2013). "Last Tupolev TU-154 Delivered – 16 Years After Production Ceases". Airline Reporter. Retrieved 12 December 2013. ^ "Tu-154 — Туполев". www.tupolev.ru. ^ "Aeroflot retires the legendary TU-154s". Flight Global. 2010-01-18. Retrieved 17 December 2010. ^ "Crash focuses attention on Tupolev-154". BBC News. 10 April 2010. Retrieved 26 May 2010. ^ "AeroTransport Data Bank". Retrieved 26 December 2014. ^ "The Last Serial Tu-154 Was Delivered to the Representatives of Russian Defense Ministry". Vzglyad.Ru. 2013-02-19. Retrieved 19 February 2013. ^ "Наука и техника: Оружие: Шойгу получит последний самолет Ту-154М". Lenta.ru. Retrieved 2013-08-16. ^ OKB Tupolev, A History of the Design Bureau and its Aircraft, Yefin Gordon and Vladimir Rigmant, translated by Alexander Boyd, edited by Dmitriy Komissarov (Hinckley, UK, 2005) ISBN 1-85780-214-4 p. 257. ^ "AirForceWorld.com Tu154md Electronic Intelligence Aircraft". AirForceWorld.com. Archived from the original on 2011-03-05. Retrieved 30 April 2011. ^ "✈ russianplanes.net ✈ наша авиация". russianplanes.net. Archived from the original on 2013-03-13. Retrieved 2016-12-26. ^ "✈ russianplanes.net ✈ наша авиация". russianplanes.net. Archived from the original on 2017-08-15. Retrieved 2017-08-15. ^ "✈ russianplanes.net ✈ наша авиация". russianplanes.net. Archived from the original on 2016-12-11. Retrieved 2016-12-26. ^ "Prior To Landing Troops In India, China Carried Out Spy Sorties With Tupolev Tu154M Aircraft". www.defenseworld.net. ^ Kramer, Andrew E. (21 June 2011). "It Danced Once, but More Often It Crashes". New York Times. ^ a b "Russia grounds all its TU-154 planes after crash". RTE.ie. 2016-12-27. Retrieved 2016-12-27. ^ a b "PressTV-Russia grounds all Tupolev-154s after jet crash". presstv.ir. Retrieved 27 December 2016. ^ "Iran unveils upgraded missile, five pieces of military hardware". Tehran Times. Archived from the original on 2012-08-25. Retrieved 2013-08-16. ^ Harro Ranter. "Aviation Safety Network – ASN Aviation Safety Database results". Retrieved 26 December 2016. ^ Harro Ranter. "Aviation Safety Network – ASN Aviation Safety Database results". Retrieved 26 December 2014. ^ "Russian airlines should ground Tu-154s, watchdog says". BBC News. 2 January 2011. Retrieved 2 January 2011. ^ "Rosja. 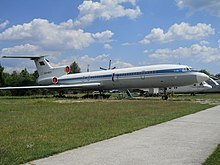 Tu-154M mogą wyjść z eksploatacji od 1 lipca". Rzeczpospolita. Archived from the original on 2 April 2015. Retrieved 26 December 2014. ^ "Uzbekistan Airways renews aircraft fleet". Archived from the original on July 17, 2011. ^ Accident description for CCCP-85023 at the Aviation Safety Network. Retrieved on 2015-12-21. ^ Accident description for CCCP-85030 at the Aviation Safety Network. Retrieved on 2015-12-21. ^ Accident description for SU-AXB at the Aviation Safety Network. Retrieved on 2015-12-21. ^ Accident description for HA-LCI at the Aviation Safety Network. Retrieved on 2015-12-21. ^ Accident description for CCCP-85102 at the Aviation Safety Network. Retrieved on 2015-12-21. ^ Accident description for CCCP-85020 at the Aviation Safety Network. Retrieved on 2015-12-21. ^ Accident description for LZ-BTN at the Aviation Safety Network. Retrieved on 2015-12-21. ^ Accident description for LZ-BTB at the Aviation Safety Network. Retrieved on 2015-12-21. ^ Accident description for CCCP-85169 at the Aviation Safety Network. Retrieved on 2015-12-21. ^ Accident description for P-885 at the Aviation Safety Network. Retrieved on 2018-02-26. ^ Accident description for CCCP-85103 at the Aviation Safety Network. Retrieved on 2015-12-21. ^ Accident description for CCCP-85355 at the Aviation Safety Network. Retrieved on 2015-12-21. ^ Accident description for YR-TPH at the Aviation Safety Network. Retrieved on 2015-12-21. ^ Accident description for CCCP-85321 at the Aviation Safety Network. Retrieved on 2015-12-21. ^ Accident description for CCCP-85029 at the Aviation Safety Network. Retrieved on 2015-12-21. ^ Accident description for HA-LCF at the Aviation Safety Network. Retrieved on 2015-12-21. ^ Accident description for CCCP-85480 at the Aviation Safety Network. Retrieved on 2015-12-21. ^ Accident description for CCCP-85243 at the Aviation Safety Network. Retrieved on 2015-12-21. ^ Accident description for CCCP-85338 at the Aviation Safety Network. Retrieved on 2015-12-21. ^ Accident description for CCCP-85311 at the Aviation Safety Network. Retrieved on 2015-12-21. ^ Accident description for CCCP-85327 at the Aviation Safety Network. Retrieved on 2015-12-21. ^ Accident description for CCCP-85254 at the Aviation Safety Network. Retrieved on 2015-12-21. ^ Accident description for CCCP-85413 at the Aviation Safety Network. Retrieved on 2015-12-21. ^ Accident description for CCCP-85479 at the Aviation Safety Network. Retrieved on 2015-12-22. ^ Accident description for CCCP-85067 at the Aviation Safety Network. Retrieved on 2015-12-22. ^ Accident description for YR-TPJ at the Aviation Safety Network. Retrieved on 2015-12-22. ^ Accident description for CCCP-85268 at the Aviation Safety Network. Retrieved on 2015-12-22. ^ Accident description for CCCP-85664 at the Aviation Safety Network. Retrieved on 2015-12-22. ^ Accident description for CCCP-85097 at the Aviation Safety Network. Retrieved on 2015-12-22. ^ Accident description for CU-T1227 at the Aviation Safety Network. Retrieved on 2015-12-22. ^ Accident description for CCCP-LZ-BTD at the Aviation Safety Network. Retrieved on 2015-12-22. ^ Accident description for RA-85282 at the Aviation Safety Network. Retrieved on 2015-12-22. ^ Accident description for RA-85234 at the Aviation Safety Network. Retrieved on 2015-12-22. ^ Accident description for 85222 at the Aviation Safety Network. Retrieved on 2015-12-22. ^ Accident description for YA-TAP at the Aviation Safety Network. Retrieved on 2015-12-22. ^ Accident description for CCCP-85269 at the Aviation Safety Network. Retrieved on 2015-12-22. ^ Accident description for CCCP-85528 at the Aviation Safety Network. Retrieved on 2015-12-22. ^ Accident description for CCCP-85105 at the Aviation Safety Network. Retrieved on 2015-12-22. ^ Accident description for 85533 at the Aviation Safety Network. Retrieved on 2015-12-22. ^ Accident description for EP-ITD at the Aviation Safety Network. Retrieved on 2015-12-22. ^ Criminal description for 85163 at the Aviation Safety Network. Retrieved on 2015-12-22. ^ Criminal description for 85359 at the Aviation Safety Network. Retrieved on 2015-12-22. ^ Accident description for RA-85296 at the Aviation Safety Network. Retrieved on 2015-12-22. ^ Accident description for RA-85656 at the Aviation Safety Network. Retrieved on 2015-12-22. ^ Accident description for B-2610 at the Aviation Safety Network. Retrieved on 2015-12-22. ^ Accident description for UN-85455 at the Aviation Safety Network. Retrieved on 2015-12-23. ^ Accident description for RA-85164 at the Aviation Safety Network. Retrieved on 2015-12-23. ^ Accident description for RA-85621 at the Aviation Safety Network. Retrieved on 2015-12-23. ^ Accident description for 11+02 at the Aviation Safety Network. Retrieved on 2016-12-04. ^ Accident description for 65-9405 at the Aviation Safety Network. Retrieved on 2016-12-04. ^ Accident description for EY-85281 at the Aviation Safety Network. Retrieved on 2015-12-23. ^ Accident description for CU-T1264 at the Aviation Safety Network. Retrieved on 2015-12-23. ^ Accident description for B-2622 at the Aviation Safety Network. Retrieved on 2015-12-23. ^ Accident description for HA-LCR at the Aviation Safety Network. Retrieved on 2015-12-23. ^ Accident description for RA-85845 at the Aviation Safety Network. Retrieved on 2015-12-23. ^ Wines, Michael (2001-10-14). "After 9 Days, Ukraine Says Its Missile Hit A Russian Jet". The New York Times. ^ Accident description for EP-MBS at the Aviation Safety Network. Retrieved on 2015-12-28. ^ Accident description for EP-LBX at the Aviation Safety Network. Retrieved on 2015-12-28. ^ Accident description for RA-85816 at the Aviation Safety Network. Retrieved on 2015-12-28. ^ Accident description for A9C-DHL at the Aviation Safety Network. Retrieved on 2015-12-28. ^ Criminal description for RA-85556 at the Aviation Safety Network. Retrieved on 2015-12-28. ^ Accident description for RA-85185 at the Aviation Safety Network. Retrieved on 2015-12-28. ^ Accident description for EP-MCF at the Aviation Safety Network. Retrieved on 2015-12-28. ^ Accident description for RA-85667 at the Aviation Safety Network. Retrieved on 2015-12-28. ^ Accident description for EP-CPG at the Aviation Safety Network. Retrieved on 2015-12-28. ^ Accident description for RA-85787 at the Aviation Safety Network. Retrieved on 2015-12-28. ^ Accident description for 101 at the Aviation Safety Network. Retrieved on 2015-12-28. ^ BBC News – Two dead as engine failure airliner lands in Moscow. Bbc.co.uk (2010-12-04). Retrieved on 2010-12-10. ^ Russian Passenger Jet Explodes; 3 Dead. Cbsnews.com (2011-01-01). ^ "PressTV-92 presumed dead in Russia military plane crash". ^ "Crashed near Sochi on Tu-154 was built in 1983". LatestNewsResource. 2016-12-25. Archived from the original on 2016-12-26. ^ "Tu-154 — Туполев". www.tupolev.ru. Retrieved 26 January 2019. ^ "Tu-154 Careless". www.globalsecurity.org. Retrieved 14 January 2019. ^ "Tu-154B Flight Crew Operations Manual". ^ a b Originally measured as 10,500 kgf. This page is based on the Wikipedia article Tupolev Tu-154; it is used under the Creative Commons Attribution-ShareAlike 3.0 Unported License (CC-BY-SA). You may redistribute it, verbatim or modified, providing that you comply with the terms of the CC-BY-SA.